In my last post I talked about how I use book chats in my high school English classroom. 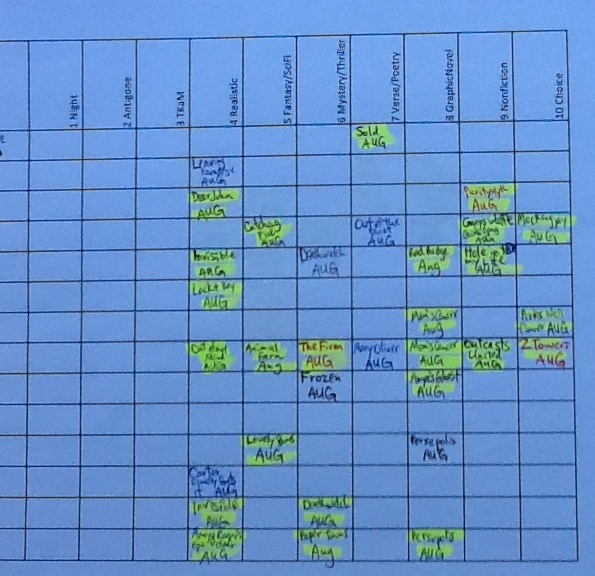 In this post, I’d like to share how I keep track of the required books that my students read. I have required my students to read 20 books this school year, which I have divided into 10 books per semester. Of these 10, my students choose 7 of them. The other 3 are mandated by our school’s curriculum. I created a chart in Microsoft Excel listing the seven genres my students need to read by the end of the school year. As you can see, I listed the three required titles as well as the seven genres across the top row. I realize now I really didn’t need to include the required titles. When we finish each of those units, I’m going to automatically give each student credit for that particular book unless I have a strong belief that the student did not do the outside reading. If that’s the case, I’ll hold a book chat with that student to see if he or she read it. I’m thinking specifically about To Kill a Mockingbird because it’s the longest book, and in the past I’ve had students admit (or brag!) afterward that they didn’t actually read it. We will read all of Antigone in class, so I know each student will get credit for that play. The focus here is on the different genres. When I hold a book chat with a student, I record a title or a portion of the title in the appropriate genre box along with the month the conference was held. Looking at the picture above, I realize I got so used to recording AUG that I never switched over to SEPT for all the September book talks I’ve held so far. Oops! Ha ha. I’ll make sure and change to SEPT on this coming Monday. I then have to transfer the book chat into my online grade book. 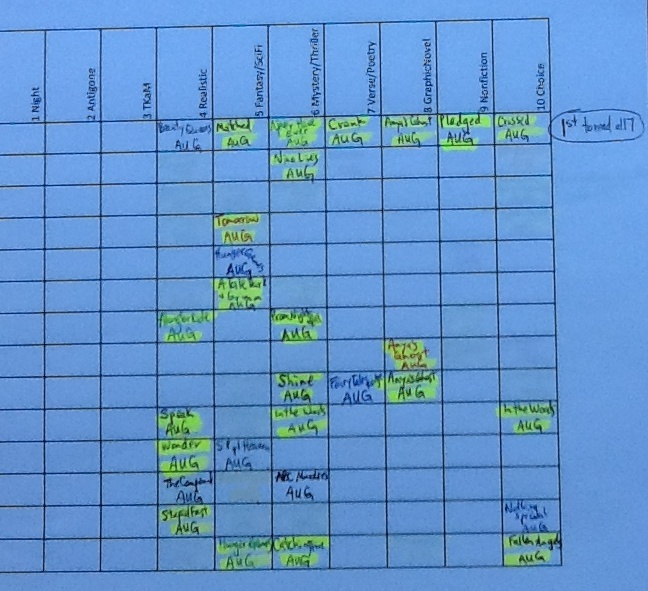 At first I tried to use sheer memory to update the book chat grades, but then I wised up and whipped out a highlighter. I highlight the books that I have added to a student’s grade. I try to update these grades once or twice a week. I probably get way too much satisfaction out of getting to highlight those books afterwards. It’s the little things, people. Let’s do a quick little case study of the class below. I’ve removed my students’ last names, so I think I’m not breaking any laws here. Lauren has yet to read any books. She sits right by my desk, so she hears book chats taking place on most days. She’s currently reading a Nicholas Sparks book, and she told me on Friday she plans to finish it this weekend. “Can we have a book talk on Monday?” she asked me yesterday. I told her she could go first. She will need to read much faster the rest of the semester is to reach the 10-book goal. Michelle is an avid reader. In fact, I decided to let her put some books in the bank for next semester. Since The Perks of Being a Wallflower is historical fiction and that genre is not required until the spring, I’m letting her count it now. She still has to read all seven choice genres for the fall semester, though. Gunnar has only read one genre so far, but it was a lengthy nonfiction piece (Stiff by Mary Roach) that required more time than most other books. I’ve also discovered that he volunteers at a fire station on the weekends, so he doesn’t have as much time as other students to read. I wonder how he will fit in all the books for this semester. I need to talk to him about that. Brett has read three books, but they have all been fairly short. Frindle is not in my class library, and I doubt it is in our high school library. It’s more of an elementary or middle school book. I remember listening to it on tape my first year of teaching middle school reading. For his fantasy/sci fi, he selected J. K. Rowling’s Tales of Beedle the Bard, which is in my library. This collection of short stories is very tiny, but I count this book the same as the much-longer, much-more-complex Feed that Michelle read. Brett’s third book is the graphic novel of Frankenstein, and glancing at the chart, I see that he is the only student from this page to have read a graphic novel. I have to commend him on that. I also have to wonder why so few students have tried a graphic novel. I should probably do more book talks about them, and perhaps enlist the help of our librarian. For Brett’s final books of the semester, I want him to read longer, more complex books. I know he can handle it, but maybe he wanted to get ahead on his genre requirements early in the year. He’s a cross country runner, so he’s fairly busy. For the spring chart, I won’t include Fast Food Nation or Julius Caesar, two required whole-class pieces. 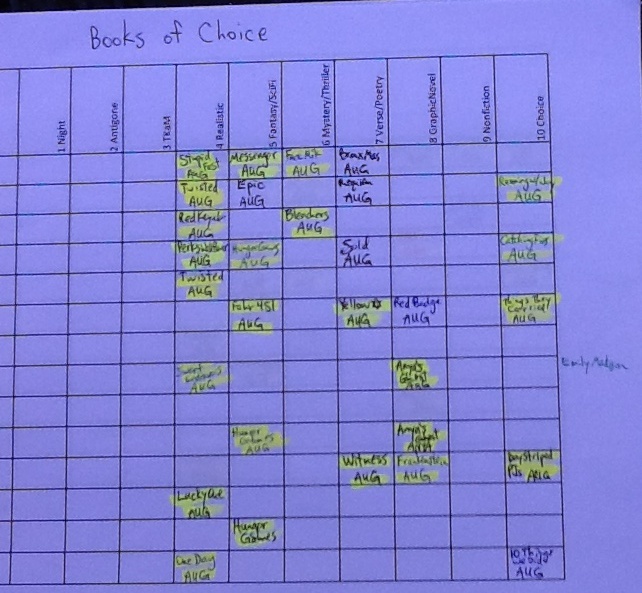 Students get to choose a multicultural novel from a list of four, for the third curriculum-required book, so I will include that on the chart. I will probably do book chats for that book. There might be better or easier ways for me to keep track of the books my students read, but this is what works for me. Any thoughts out of there? What works in your classroom? I love the reflection to which this chart led you. I feel guilty, but also will defend myself, when I say I do not require students to read from each genre. While reading The Book Whisperer, I seriously considered this, but I still will not require it this year, until someone can prove to me the reason why. 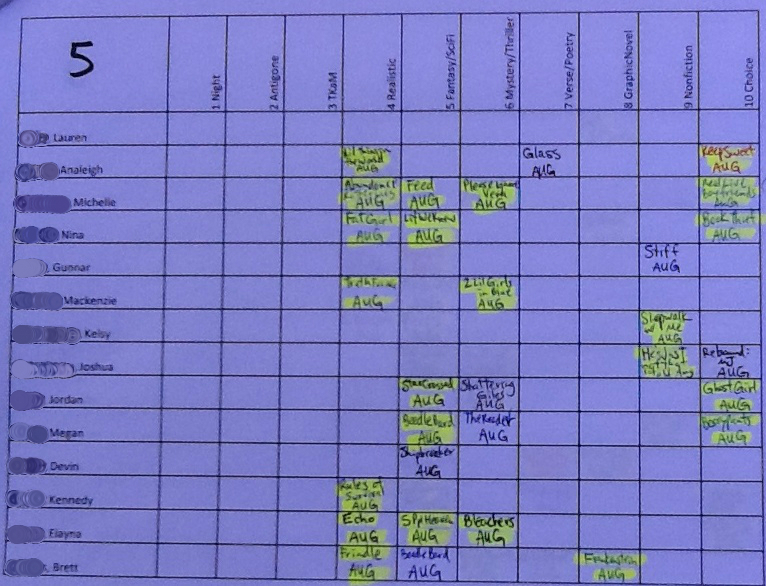 What I do get to do this year, however, that I have not done in the past, is 1-1 conferences every week. So every two weeks I see a student, and can really get to know what types of books s/he gravitates towards, then I will bring in books from other genres that could appeal to them. So… Even though I feel a tinge of guilt, I’ll be sure to look for those opportunities to suggest other genres. Thank you for sharing and detailing just what you do for record-keeping! It’s very helpful, and makes me reflect on mine once again! Response to Marcia, Marcia, Millennials!